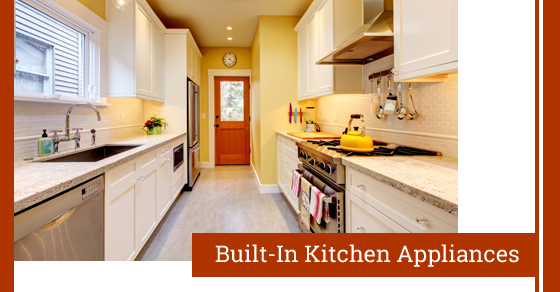 The kitchen is often considered as the heart of the home. Most of the time spent in the kitchen is when you’re cooking, so it is important that you choose the appliances correctly to suit both your home’s decor and lifestyle. Built-in wall appliances are a common option in many contemporary settings in order to give the kitchen a more streamlined look. Depending on the kitchen design and appliance model, homeowners can choose to fit the built-in appliance under the worktop, in-column, or within kitchen cupboards for convenient eye-level operation. With an increasing number of homeowners looking to declutter their kitchens, installing under-the-counter fridges seem like a great option to not only get more space, but also go green. This quick and easy addition has a height of about 25-30 inches, allowing it to fit in a variety of spaces and use up less energy to refrigerate your food. Modern, space-saving appliances like fridges and ovens are made of stainless steel and aluminium, making them stylish enough to match any kitchen décor. That said, most appliances are specially designed to complement other appliances, so you can choose from a wide range of materials, colours, designs, and textures. If your kitchen’s paint job adds to the room’s uniqueness, compliment it with matching appliance colours. An integrated approach gives you the flexibility to select the best combination of features and appliances to suit your cooking style and food preferences. Installation options, such as cube configuration, side-by-side bank, or in-column towers add to the allure of built-in kitchen appliances, giving you the freedom to choose a layout configuration that suits your space, style, and needs. There are some appliances that offer great convenience as stand-alone units, so combining them with your integrated kitchen can offer you the best of both worlds. For instance, users can combine the benefits of a wall appliance such as a combo-oven with a statement unit, such as a free-standing range cooker, or other appliances with matching controls and aesthetics to give you that streamlined look. You can equip your island with electronic controls, under-the-counter appliances, and stylish design to maximize on kitchen space, so you have a charging station, entertainment hub, and a homework centre. Lastly, you should look out for user-friendly features when shopping for appliances, such as programmable LED timers and telescopic rails for built-in ovens to assist with loading and offloading heavier options. Considering the high kitchen appliance costs, you should ensure they are professionally installed by a registered design team.